So I’ve had both my iPhone 5 and my Samsung Galaxy SIII for several months now. And while I’m an unapologetic Apple fan boy, I have had the opportunity to rock the SGIII for a minute. As such, I’ve formed an appreciation for both Samsung products and the Android OS. If you’ve been following the mobile space, you know that Samsung has been making aggressive moves to compete with Apple. Indeed, for most tech observers, it really is a two way contest, Apple vs. Samsung (and iOS vs. Android). Apple’s once unmatched dominance has been tested, and fissures are starting to appear in the foundation. But just because folks are buying Samsung devices in droves doesn’t necessarily mean that they make better phones. Or that Apple isn’t the King of the Hill. 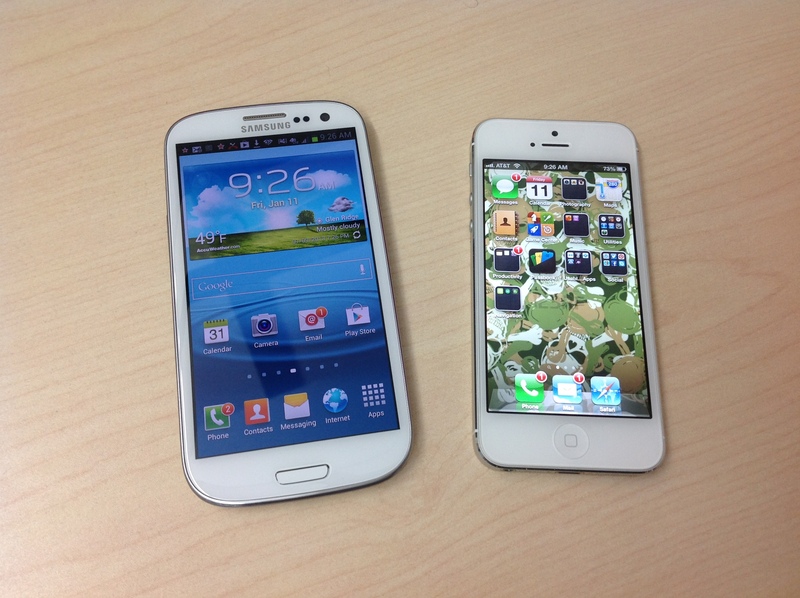 So lest anything think that the fact that Samsung’s shipping millions of new units each quarter mean that Apple is slipping, I decided to do a head-to-head comparison between the iPhone 5 and the Galaxy SIII. And put such foolishness to rest. Spoiler Alert: the iPhone wins. Now we already know that the SGIII is bigger (and wider) than the iPhone 5. We know that the SGIII has NFC (near field communication) and the iPhone 5 does not. The SGIII can view Flash content and the iPhone 5 cannot. Wirefly already broke it down for you Android lovers. I’m not interested in the things we already know. I don’t know about you, but I HATE the fact that mobile phones die so quickly. I don’t care what kind of phone you’ve got. If you use it with any degree of regularity, your phone dies. The batteries drain so quickly it’s laughable. Both the iPhone and SGIII get poor marks for performance in this area. On paper, the SGIII seems to have longer standby and usable battery life. But in my unofficial field testing, and in real life, that’s not the case. I’ve never actually measured the amount of usable (vs standby) time I get, but this weekend, I left both devices alone for four hours, to see which would have more juice left when I returned. They were both at 100% before I started my test. However, when I got back, the SGIII was at 67%, while the iPhone was at 92%. In my day-t0-day, I routinely pick up a dead SGIII, which infuriates me to no end, considering how lightly it’s used. Apps are my business. As such, I’m constantly testing UI, functionality and usability. For many of my clients, apps have to work in both iOS and Android environments, so having the iPhone 5 and SGIII is more function over fashion. Even though the Android marketplace has been around for a bit, app developers have not seen fit to create apps with the same fervor as they have for Apple. As a result, you’ve got more ‘launcher’ apps in Android, which open mobile websites than you have pure apps. Those apps that do exist on both platforms, simply don’t perform the same. For one, the SGIII is so unwieldy that it’s difficult to manage with one hand. Plugging in your username and password, or simply navigating from thing to thing is a challenge. The fact that you can’t simply go back a step on apps, from within the app, and have to use that quirky back icon on the phone to reverse is another thing that I can’t stand about the SGIII. Especially if you’ve been using the phone for a minute and the icon isn’t illuminated. On the SGIII, apps are crap. In the US alone, mobile phone users send over 200 billion text message a month. Texting has replaced traditional phone calls as the preferred mode of communication. And it’s uber important to the kid because it lets me communicate with clients, colleagues and family, quickly and easily. Before I got the SGIII, I was pretty comfortable texting. I could fly over the iPhone’s touch screen keyboard, authoring and sending text messages with ease. But ever since the SGIII hit my palm, I’ve regressed into a fumbling bumbling idiot. The keyboard is also one of my biggest issues with the SGIII. The buttons are so small and cramped together, that I frequently hit the wrong button, and end up having to delete and re-enter things. And did I mention that wacky back button? I’m sure folks who are familiar and comfortable with the SGIII keyboard will protest, but WHATEVER! The iPhone 5 beats the SGIII for battery life, the usability and functionality of apps, and the ease of texting. I’m sure I’m going to get a flurry of comments (or at least one comment – Winston Clayton) about how I’ve been somewhat less than objective in my assessment. To be fair, I am biased. Note the spoiler alert above. But when you’ve been rocking with the best mobile device maker for the past decade, toppling them is no simple task. And despite the opinions of the Samsung bandwagoneers, Apple still rocks!